Camelot references aside, Saturday was truly glorious. The bees were flying furiously here, loaded with pollen–white, bright yellow, and salmon. 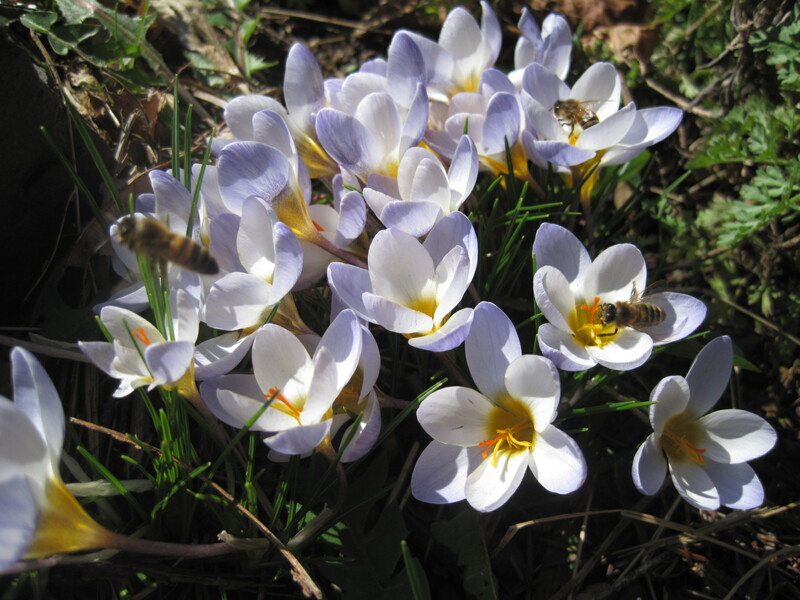 This small clump of snow crocus easily had twenty bees on it continuously as I watched. The hellebores were also seeing some traffic. Filberts continue to offer up pollen, as well as a few scattered dandelions. I even saw some henbit blooming in the sheltered lee of a neighbor’s barn. What’s blooming in your neighborhood? Bees were active yesterday, bring in tan, lite yellow, and orange pollen. 4 hives very active and 1 weak, 3 did not make it. Ken, I’m sorry about your lost hives. Why do you think they went down? Any guesses on your pollen sources? The tan has me especially curious.